Growth in demand for agricultural products is an important step in improving the economic outlook for production agriculture, especially in light of abundant global inventories. Growth in demand, or consumption, is often slow as the key drivers – population and consumption trends- are themselves slow to change. This year the livestock sector received some good news as the USDA reported increases in per capita consumption for several categories of meat. In this week’s post, we take a look at the long-run trends in U.S. meat consumption. Before digging in, it’s important to clarify a point about the data. The USDA reports per capita meat disappearance. This metric is the residual of production, beginning and ending inventories, import, and export data. So while the USDA does not explicitly measure consumption, they do offer a proxy measure in the form of disappearances – which is essentially consumption. When discussing consumption in this post, we are truly reporting the USDA’s reported meat disappearances. With that said, total red meat and poultry consumption is shown in figure 1. These data have been reported since 1970 and the USDA’s WASDE report provides forecasts for 2016 and 2017. Since 1970, total red meat and poultry consumption has averaged 204 pounds per capita. Overall, consumption has trended higher as levels were generally less than 200 pounds prior to 1990 and have generally exceeded 200 pounds since 1990. Between 2004 and 2007 consumption peaked and remained at 222 pounds. After 2007, total consumption fell as low as 202 pounds in 2014, a 9% total decline. The impacts of the Great Recession and generally strong meat prices – as a result of limited supplies – certainly took a measurable impact. Since 2014, total consumption has turned higher. For 2016, per capita total red meat and poultry consumption is forecast at 215 pounds with even more increases expected into 2017 (218 pounds). If these estimates come to fruition, U.S. per capita meat consumption in 2016 would be at the highest levels in 8 years. In addition to consumption levels, it’s also important to consider timing. From 2008 to 2014 per capita consumption fell from 216 pounds to 202 pounds. Based on the latest USDA estimates, per capita consumption is expected to exceed 2008 levels by 2017 (218 pounds). The pace at which overall meat consumption rebounded – erasing 7 years of decline in 3 years – is pretty impressive. Many wondered if a recovery to this level would be possible. Figure 1. 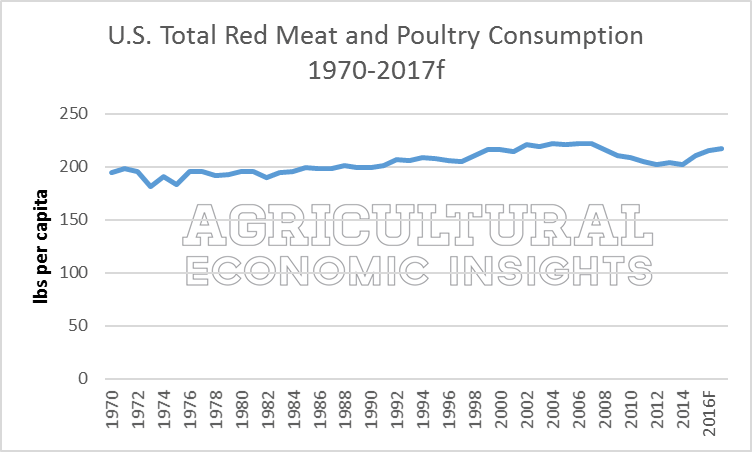 Per Capita U.S. Total Red Meat and Poultry Consumption, 1970 – 2017f. Data Sources: USDA ERS and WASDE. Beef consumption has been on a long decline (figure 2). Per capita beef consumption peaked in the 1970s at 94 pounds and reached a low of 53.9 pounds in 2015. Prior to the 2008, consumption hovered around 65 pounds. While per capita beef consumption is expected to be 1.5 pounds higher in 2016 (up to 55.4 pounds), it’s still a long way from the levels reached just a decade ago. Figure 2. Per Capita U.S. 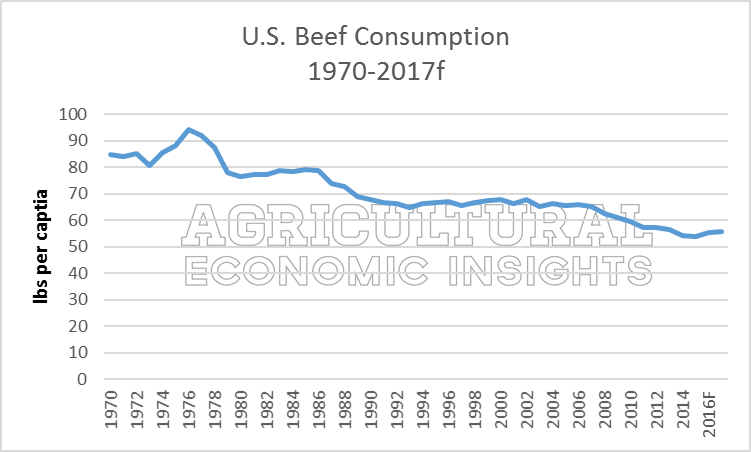 Beef Consumption, 1970 – 2017f. Data Sources: USDA ERS and WASDE. On the other hand, per capita pork consumption has been mostly sideways since the 1970s (figure 3). Over 48 years of data, per capita pork consumption has averaged 50.5 pounds and has not been higher or lower than 10 pounds of the mean. In other words, per capita pork consumption in the U.S. has not ranged more than +/- 20% of the 48-year average. Similar to beef, pork consumption fell after 2007 and has since started to recover. Different than beef, pork consumption has actually returned to levels of the late 1990s and 2000s. Figure 3. 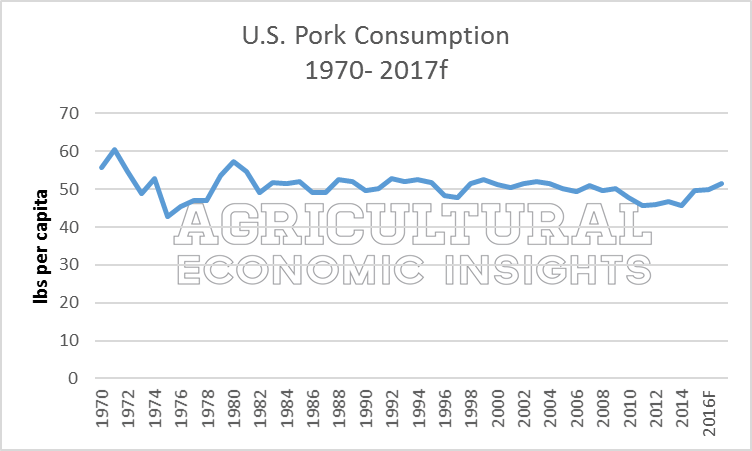 Per Capita U.S. Pork Consumption, 1970 – 2017f. Data Sources: USDA ERS and WASDE. The biggest story has been the growth in per capita poultry consumption over the last several decades (figure 4). Per capita total poultry consumption in the U.S. during the early 1970s was nearly 50 pounds. By 2003, consumption surpassed 100 pounds per person. In 2016 poultry consumption is forecast at 108 pounds per person, a record high. So while poultry consumption also fell after 2007, it has since rebounded to reach records levels. With poultry consumption at record levels, it’s worth noting that its growth rate has slowed considerably in recent years. From 2000 to 2016, poultry consumption increased 13% (from 95.4 pounds to 108.0 pounds). In the earlier 17-year period poultry consumption grew by more than 55% (60.8 pounds in 1983 to 94.4 pounds in 1999). Figure 4. 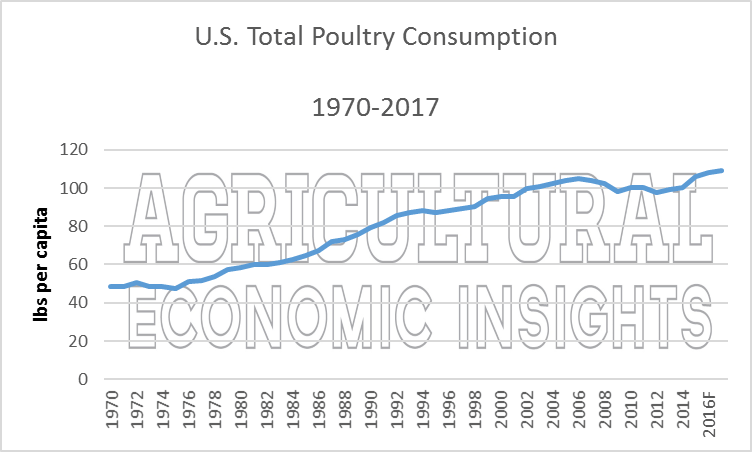 Per Capita U.S. Total Poultry Consumption, 1970 – 2017f. Data Sources: USDA ERS and WASDE. A great way to illustrate the growing role of poultry (and shrinking role of red meat) in the U.S. diet is considering red meat consumption (per capita) as a share of total per capita red meat and poultry consumption (shown in figure 5). In 1970, red meat accounted for 75% of total meat consumption. In other words, for every 4 pounds of meat consumed, 3 pounds were red meat and 1 pound was poultry. For 2016 red meat is forecast to account for 49.6% of the total. Or, for every pound of red meat consumed there is slightly more than one pound of poultry consumed. Even with the forecast of higher beef and red meat consumption in 2016 and 2017, growth in poultry consumption is also underway. Figure 5. 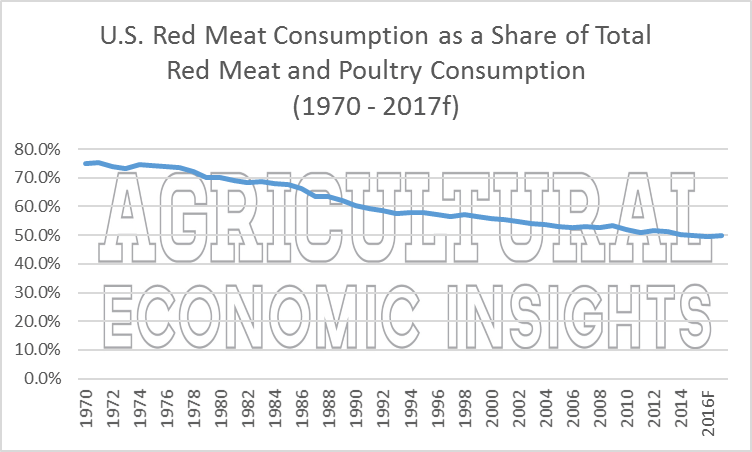 Per Capita U.S. Red Meat Consumption as a Share of Total Red Meat and Poultry Consumption, 1970 – 2017f. Data Sources: USDA ERS and WASDE. Overall U.S. per capita meat consumption (total red meat and poultry) is estimated to be higher in 2016 and 2017. The recent uptick in consumption begins to erase several years of declines that resulted from the Great Recession and high meat prices. Pork consumption has returned to pre-decline levels while poultry is setting record consumption. While beef and pork consumption is expected to turn higher in 2016 and 2017, the increases are not large enough – at this point – the significantly reverse several decades of trends. This is especially the case in given red meat’s shrinking role in overall red meat and poultry consumption (figure 5). Following several years of decline after 2007, many wondered if per capita meat consumption would recovery. Looking ahead, the upward turn in in per capita meat consumption is a bright spot for agriculture in the coming years.